The Canada Council for the Arts (CCA) held an info session in Victoria at the end of January. The two program officers at the session encouraged attendees to apply for grants and handed out cards for the program officers in each discipline. They suggested we call our individual program officers to discuss applications. I had applied for a B.C. Arts Council (BCAC) grant last fall and had just learned that my application had not been successful. The timing seemed propitious. Two voice mail messages to the BCAC program officer, seeking feedback on my application, had not been returned. I was hoping that the CCA officer might be more forthcoming. And, to his credit, he was that. Almost immediately, he told me that I was not a strong candidate for a grant because I take too long to write a book. It seems the expectation is that a writer can produce a novel in one year. When I explained to him that I work full-time and can only take so much time off each year, he said I could explain that in my application, but unless the writing sample was exceptional, the peer review group would probably not want to take a chance on me. They grant money to people who they think will finish their project in a timely fashion. Since it took me eight years to finish Plastic, I do not fall into the "timely" category. I hope to complete my next book in five years. But that still isn't fast enough. I was left with the impression that I would only be taken seriously if I gave up my job or at least took a one-year leave to work full-time on the book. I would love to do this, but the reality is that I cannot. My employer would not agree to a one-year leave of absence and my mortgage would not get paid. This is very disappointing news for most writers in Canada. Very few of us earn enough to live on from our writing. In cities like Toronto, Vancouver and Victoria, where housing costs eat up more than half our salaries, taking even three months unpaid leave is a financial impossibility. So in spite of the very positive encouragement from the program officers at the info session, the honest answer is much more grim. I will have to wait until I retire before I can meet the criteria the peer review group seeks. I am disappointed by this answer, but at least now I know the truth. I am grateful for that. This morning Christine Cowley from the Bay 88.7 FM interviewed me for her monthly talk show, Storylines. Christine is a warm and thoughtful interviewer who likes to showcase new Canadian authors and local writers from Muskoka, Ontario. It was such a pleasure to speak with her about the book. Christine asked me in-depth questions about Plastic: what is the significance of the stories from minor characters in the book, what is the connection between social media and self-perception and who I was hoping to reach with the book? We also talked about the vulnerability of women in our society. You can hear my answers on Saturday, July 14 about 8 am EST or Wednesday, July 18 around 11 pm EST. Shortly thereafter, the station will upload a podcast, which I will also post on my site. The Bay 88.7 FM is a community radio station serving cottage country in Ontario (their broadcast area covers all of Muskoka). Over 60 volunteers, including Christine, create the programming content, which includes a full selection of talk shows on Saturday and Sunday mornings, called Muskoka Magazine. They have an international audience, who tune in directly through the site or through an app. Their eclectic mix of content offers something for everyone. After the interview, Christine and I discussed the writing life. It is a tough slog sometimes, and we writers can wonder just why we devote so many hours to our work. We reminded each other that it isn't the outcome that is important. It is the fact we are doing something we love and expressing our creativity that brings us joy and a sense of fulfillment. In fact, we both agreed that we couldn't imagine not writing. Christine is working on her first novel, after a career of writing non-fiction and interviewing fellow writers. I wish her the best of luck. A huge thank you to Christine for her insightful questions and for having me on her show. 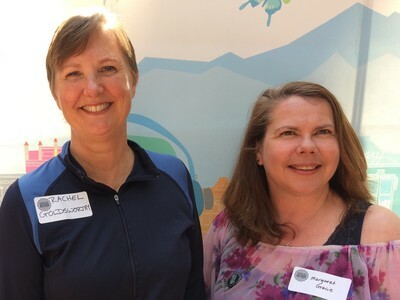 Saturday, May 12, was the launch of the Emerging Local Authors Collection at the main branch of the Greater Victoria Public Library. This is the fourth year of the program, which highlights the work of local authors. The library has now displayed over 600 books written by Victoria writers, young and old alike. There are children's books, poetry books, fiction and non-fiction books, either published by small presses or self-published in paper or e-book format. This year, my book Plastic joined the roster. 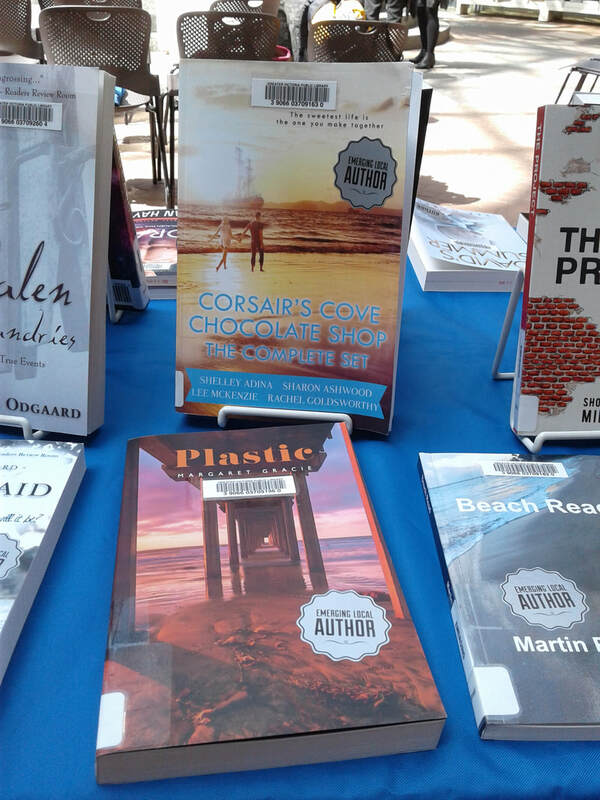 The launch was a great opportunity to connect with fellow writers and check out the selection of books on display this year. One of my writer friends, Rachel Goldsworthy, also has a book in the collection this year. So we were able to share in the celebration together. A huge thank you to the Greater Victoria Public Library for showcasing the work of local authors.